It’s been a couple of months since I read this, but I think my impressions of it are intact. I picked it up after hearing an interview with the author and learning the topic was one which has been on my mind for years, how to cope with our ever-faster, ever-more-connected, ever-more-constantly-interrupted digital lives. It takes the encouraging approach of offering a series of profiles of individuals throughout Western history who successfully found ways to take advantage of revolutionary changes in the speed and volume of communication while preserving the ability to detach, withdraw, and lead rich inner lives. They found ways, and Powers feels sure we’ll find ways. Most of what I found here were ideas I and many others have already thought and said, but it did offer some useful terminology to clarify the conundrums, especially Marshall McLuhan’s division of technologies into “hot” and “cold”. Those are handy terms to describe my attempts at digital reading. When I tried to read a book on an iPad, I got nowhere. The “heat” of the 500 other functions lying behind the page was constantly pulling me out of reading. Moments of going to check this or just quickly do that or pursue a Google search of this question prompted by what I was reading piled up until the book was forgotten. The iPad was just too hot a property. It wasn’t until I got a Kindle — good only for reading and abysmally bad at everything else — that the tempo slowed and I made it to the end. I could, of course, have just gotten the physical book if I were willing to forgo the advantages of digital downloads, but I’ve also arranged to have articles from the Web which I’ve marked to be read later forwarded to my Kindle. These also were piling up untouched on my iPad, and now I actually get to them. Paradoxically, buying another, “cooler” (in this sense) gadget can sometimes provide the means of escaping the onslaught and spending slower, more carefully considered time with one selected piece of information. Powers doesn’t offer many specific suggestions of strategies, encouraging the reader to consider how the examples of the past might be adapted to his or her problems as they arise. I’ve already thought of and tried most of what he does suggest, especially unplugging for periods of time. I try at least three days a week to remain offline and as low-tech as possible at least until noon. I look forward to a time when I have fewer responsibilities and this is more feasible. One method has already failed. I tried turning off all Internet devices and relying on my cellphone, but the cellular coverage in my small town is too inadequate. When I went for a walk, the phone in my pocket chimed, and I found a half-dozen messages from my sister saying my father had been taken to the hospital an hour earlier, and asking where I was. If I’d had the Internet gadgets on, I would have gotten notifications through them, so back on they went. Now I’m pondering whether it’s worth it to buy Magic Jack (about $10 per month for the first six, $30 per year thereafter) and a dollar store corded phone, and have calls forwarded to it. Then I could turn everything else off and still hear a phone ring if I’m needed. Things get so convoluted — we have to buy high-tech to go back to low-tech in our efforts to reach no-tech. Will we find a healthy balance before we all burn out? I’m encouraged by the kids in my neighborhood. They all have smartphones, but after school, they’re riding skateboards and shooting hoops. They seem smart, physically strong, and polite. I really think they use their technology and aren’t used by it. They probably handle it better than we dinosaurs who didn’t grow up with it. Maybe we need to spend a day with them and learn. 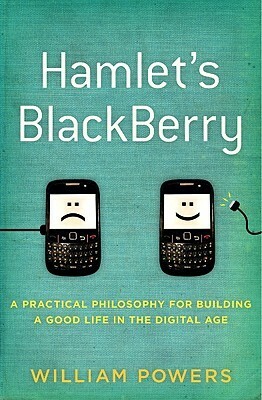 “Hamlet’s BlackBerry” is a quick read and worth the time if you are at all feeling the encroachment of electromania. The only problem I see with it is the title. I might have found something with a little more staying power. Do kids today even remember what a BlackBerry was?